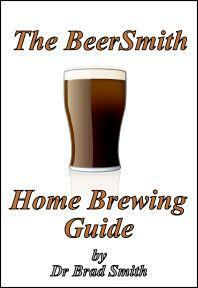 I assembled a new BeerSmith Home Brewing Guide from the collection of articles we have here on the BeerSmith Home Brewing Blog. The guide is basically a book containing just about everything an average person needs to know about home brewing. The new guide has something for everyone from beginner to advanced brewer. It represents almost all of the articles we’ve done on brewing for the last 15 months. The guide is organized into chapters, with each chapter linked into posts on that topic. It starts with simple topics like brewing your first batch of beer, and continues to more advanced brewing techniques. Later chapters include articles on specific beer styles and recipes, as well as links to other brewing resources. I may someday link these together into a complete book for publication, but for now you can enjoy the online version for free. You can click on the link above or the image to the right to jump to the new guide. Thanks again for your continued support of our BeerSmith Software and the Home Brewing Blog. I continue to add new articles each week so please make sure you have subscribed to our blog (also free) for weekly delivery by email or RSS. Nice to see so much good information all in one place….written in a clear…concise style easily accessible to novices… intermediate…and advanced brewers alike. Got BeerSmith from my daughters for my b-day a long while ago. They aren’t too happy with their decision, but iam ans so are their husbands! Got clean away from brew Kits and now I am truly happy with the results of my endeavours. This is a must have for the homebrewer!